The mechanical organ used to be one of the fairground's most popular attractions. Supplying the gay background music for the rides, it also acted as a "front of house" enticement for the side-shows. This book describes the mechanism of the organs, the music they played and their history. Chapters: Music, The Pneumatic System, Key Frames and Tracker Bars, Registers, Pipework-Percussions-Prosceniums, Scales, Tuning, A Short History. There is also a useful Appendix covering Restoration, etc. A most comprehensive book on the subject. 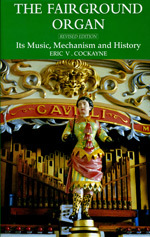 This Revised Edition was published by the St Albans Musical Museum Society in 2011.